The UK has made positive progress over the past month, culminating in the agreement between the EU and UK Brexit negotiating teams on 8th December. 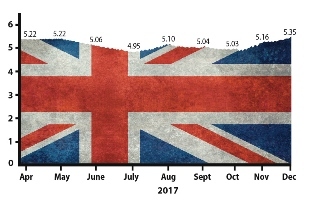 The Accountagility Index (AAX) has climbed to an all-time high of 5.35, an uptick of 19 basis points from November’s reading, and well above the pre-Referendum benchmark of 5.18. The Index records UK political and economic health in a score out of ten, and any score above 5.00 is positive. The key driver moving the Index has been the impact of the Brexit agreement, which has affected all of the political metrics. Other developments which would have depressed the Index were the rise in inflation, the drop in the markets and the negative sentiment with the US over the past weeks. On the other hand, the Pound gained a little and there was further support for a rosier view of the UK economy with sharp increases in the confidence and order books in the Manufacturing and Construction sectors. Whilst the UK Services confidence fell back slightly, the level is still consistent with a Fourth Quarter growth of 0.45%, or an annual growth rate of 1.8%. Other measures were neutral this month. Whilst this is all encouraging, there are still many uncertainties. Will the EU trade talks go smoothly? Will the messages coming from UK politicians continue to be maddeningly contradictory? Can the Index continue on its upward path since the Election? Will the winter break cause new discontinuity?